Submitted 1 year 1 month ago by The_Hunt. 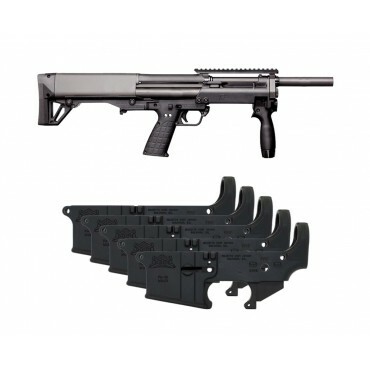 Kel-Tec KSG "NFA Ready" 12ga Shotgun, Black – KSGNRBLK Caliber: 12 GAChamber: 3”Weight (unloaded): 6.8 lbs.Magazine Capacity: 4+4 (3” Shells)Overall Length: 26.1”Barrel Length: 18.5”Trigger Pull: 5 lbs. The Kel-Tec KSG is not your ordinary tactical shotgun. Dual tube magazines hold eight 3 inch, 12 gauge shells plus one in the chamber with the flexibility of switching between various projectiles. The patented downward ejection system makes it truly ambidextrous and its lightweight, compact size gives it versatility. PSA AR-15 Lower Safe/Fire – 1728 Forged Mil-Spec Lower Made from 7075-T6 Aluminum material Black Hardcoat Anodize Finish Multi Caliber "Safe" & "Fire" marked Fire Selector High Shelf Lower These lowers are made using the most advanced aerospace manufacturing technology to produce the industries finest, forged Mil-Spec lowers. Our receivers are machined on a multimillion dollar, automated, manufacturing system which enables us to produce a product of unequaled quality and value. These forged lowers are quality made using material is 7075-T6 and are marked "CAL MULTI" to accommodate most builds. Finish is Black Hardcoat Anodize per MIL-8625 Type 3 class 2. Fire selector is marked "Safe" and "Fire". This is a "high shelf" lower. California Buyers - stripped lowers are sent to California as "Long Guns" only. PLEASE NOTE: We are not accepting phone orders on this item. Lowers may take up to 10 BUSINESS DAYS to ship from receipt of FFL information. Please help us help you by ensuring your FFL is sent in as soon as possible. Please make sure the business name of the FFL you will be using is on your order.